The K40 MCU family is pin, peripheral and software compatible with the K10 MCU family and adds full-speed USB 2.0 On-The-Go with device charge detect capability and a flexible low-power segment LCD controller with support for up to 320 segments. Devices start from 64 KB of flash in 64QFN packages extending up to 512 KB in a 144MAPBGA package with a rich suite of analog, communication, timing and control peripherals. 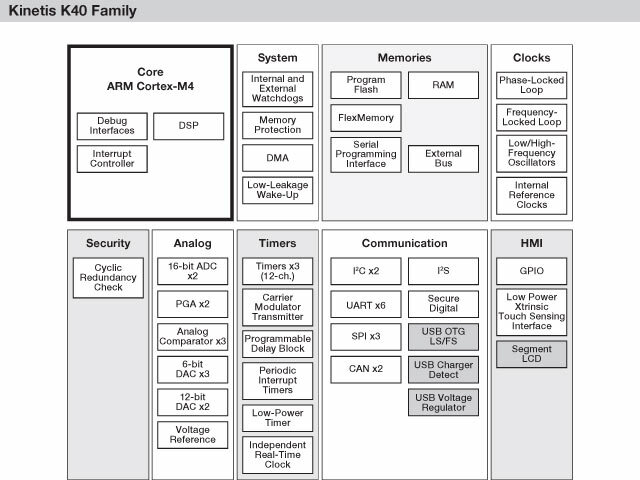 The following table summarizes the memory and package options for the K40 family. All devices which share a common package are pin-for-pin compatible.